Mark 10:1-16: Leaving there, he came to the district of Judaea and the far side of the Jordan. And again crowds gathered round him, and again he taught them, as his custom was. Some Pharisees approached him and asked, ‘Is it against the law for a man to divorce his wife?’ They were testing him. He answered them, ‘What did Moses command you?’ ‘Moses allowed us,’ they said, ‘to draw up a writ of dismissal and so to divorce.’ Then Jesus said to them, ‘It was because you were so unteachable that he wrote this commandment for you. But from the beginning of creation God made them male and female. This is why a man must leave father and mother, and the two become one body. They are no longer two, therefore, but one body. So then, what God has united, man must not divide.’ Back in the house the disciples questioned him again about this, and he said to them, ‘The man who divorces his wife and marries another is guilty of adultery against her. And if a woman divorces her husband and marries another she is guilty of adultery too.’ People were bringing little children to him, for him to touch them. The disciples turned them away, but when Jesus saw this he was indignant and said to them, ‘Let the little children come to me; do not stop them; for it is to such as these that the kingdom of God belongs. I tell you solemnly, anyone who does not welcome the kingdom of God like a little child will never enter it.’ Then he put his arms round them, laid his hands on them and gave them his blessing. Christ the Lord Jesus is the perfect King. He is absolutely superlative in nobility, wisdom, and authority, as he evidences here by once again interpreting and fixing up the law of Moses – thus showing himself superior to the greatest prophet of all Jewish history. At the same time, though, he is supremely available to all his subjects: the high-class intellectuals (the Pharisees) approach him freely and he converses with them easily, but the young mothers and children swarm around him with equal familiarity, and he is likewise at ease with them (so much so that he has to rebuke his disciples for thinking that he wouldn’t want to be bothered with such trivialities). No fairy tale prince or poet’s adventurer can match the greatness of our Lord. And if he has exemplified such dignity and goodness, surely he will teach his ambassadors (us) to do the same, if we make the effort to learn. First, he puts the Mosaic law of divorce in its proper perspective. Many scholars agree that Moses had defined the parameters for divorce in order to protect the institution of marriage from total degeneration. In other words, his people were already debasing the marriage bond in myriad ways, and his decree was the first step to regulating and recovering the primeval dignity of marriage – it was limiting abuses by setting parameters, not by giving in to the desire for fluidity. Second, Jesus – who has come to reestablish the communion between man and God that original sin had wrecked – reaffirms and reestablishes God’s original design for marriage: a permanent and exclusive union of a man and woman who share equally in the dignity of being created in God’s image. Jesus’ vision of human love and the beauty of the family had not been blurred by the prevailing clouds of selfishness, lust, and sexism. 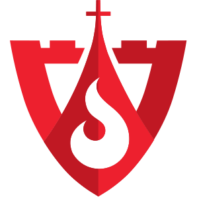 In his Kingdom, he will settle for nothing less than the pristine brilliance of selfless love, and to enable his subjects to live out such a high calling, he even elevated the natural institution of marriage to the supernatural level of a sacrament. With the help of his grace, his followers can brave every storm and gradually grow into the fullness of spousal love. Christ the Friend Children naturally trust. It is hard for them to be suspicious, even though they are often shy. For this reason they are very vulnerable; many people are not worthy of trust and will abuse the trusting soul. Jesus Christ longs to find this childlike trust in our hearts. If we put ourselves entirely into his care, he will be free to teach and guide and coach us in the art of living. When we are suspicious of him, demand proofs, and doubt his wisdom and love, we limit the range of his action – he has to spend time convincing us of his goodness before we are willing to follow his lead unhesitatingly. Picture our Lord with these babies (at the time, it was customary for Jewish women to have their babies blessed by a respected rabbi on their first birthday) and their brothers and sisters; if they were so eager to be close to him, it tells us a lot about his personality. Dour and serious types rarely attract children – kids much prefer grown-ups that have a twinkle in their eye and a quick and generous smile. If we approach Jesus with childlike trust, maybe we will more easily perceive this part of his character and catch a bit more of his joy. PS: This is just one of 303 units of Fr. John’s fantastic book The Better Part. To learn more about The Better Part or to purchase in print, Kindle or iPhone editions, click here. Also, please help us get these resources to people who do not have the funds or ability to acquire them by clicking here. 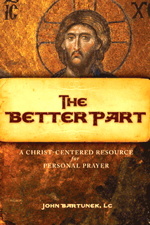 Art for this post on Mark 10:1-16: Cover of The Better Part used with permission. The Pharisees Question Jesus, James Tissot, between 1886 and 1894, PD-US author’s life plus 100 years or less, Wikimedia Commons.